Mission - Angelica Serna, 65, entered eternal rest on Monday, March 26, 2018 surrounded by her family at Paxvilla Hospice Facility in McAllen. Angelica was born on May 1, 1952 in Mexico to Eulalio and Belen Gudino. She had lived in Mission for most of her life. She enjoyed her family especially her grandchildren. Angelica lived her life to its fullest. 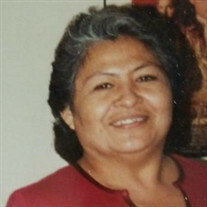 Left to cherish Angelica's memory is her husband: Mr. Francisco Serna; her children: Francisco Serna, Jr. (Sandy Arreola); Angelica Serna and Vanesa Serna; her brothers and sisters: Estella Gudino, Eliseo Gudino and Abel Gudino; four grandchildren: Samantha, Taina, Kabrina and Violeta.